BBC Earth. Forests Activity Book. Level 4 Ladybird Ladybird Readers is a graded reading series for English Language Teaching (ELT) markets, designed for children learning English as a foreign or second language. Forests have been on Earth for millions of years. Lots of animals live in forests and sometimes their lives can be very difficult. Ladybird Readers is a graded reading series of traditional tales, popular characters, modern stories, and non-fiction, written for young learners of English as a foreign or second language. Recommended for children aged 4+, the five levels of Readers and Activity Books follow the CEFR framework (Pre-A1 to A2) and include language activities that help develop key skills and provide preparation for the Cambridge English: Young Learners (YLE) exams. This Level 4 Activity Book is A2 in the CEFR framework and supports YLE Flyers exams. The activities encourage children to practice longer sentences with up to three clauses, more complex past and future tense structures, modal verbs and a wider variety of conjunctions. Аннотация к книге "BBC Earth. Forests Activity Book. 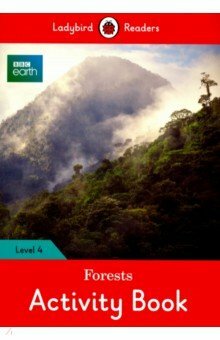 Level 4"
Forests have been on Earth for millions of years. Lots of animals live in forests and sometimes their lives can be very difficult. Ladybird Readers is a graded reading series of traditional tales, popular characters, modern stories, and non-fiction, written for young learners of English as a foreign or second language. Recommended for children aged 4+, the five levels of Readers and Activity Books follow the CEFR framework (Pre-A1 to A2) and include language activities that help develop key skills and provide preparation for the Cambridge English: Young Learners (YLE) exams. –20 % Выгода 45 ₽ Space. Activity Book 1 рец. –27 % Выгода 60 ₽ Alice in Wonderland. Activity Book. Level 4 2 рец. Если вы обнаружили ошибку в описании книги "BBC Earth. Forests Activity Book. Level 4" (автор Hannah Fish), пишите об этом в сообщении об ошибке. Спасибо!